SHIJIAZHUANG, HEBEI PROVINCE, CHINA / ACCESSWIRE / September 13, 2018 / Fincera Inc. ("Fincera" or the "Company") (OTCQB: YUANF), a leading provider of internet-based financing and ecommerce services for small and medium-sized businesses and individuals in China, today reported financial results for the second quarter ended June 30, 2018. Income for the three months ended June 30, 2018, increased 84.7% to RMB484.0 million (US$73.1 million), from RMB262.1 million in the prior-year period. Net income was RMB132.0 million (US$19.9 million) compared to a net loss of RMB17.8 million in the prior-year period. 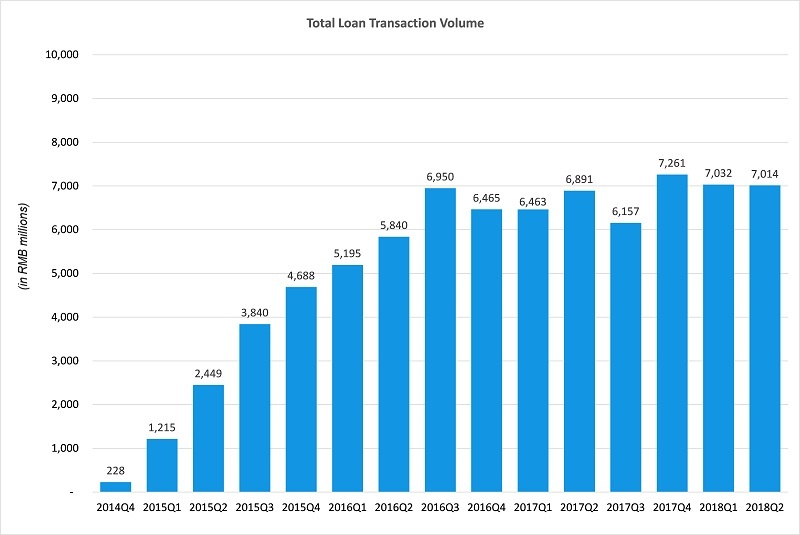 Loan transaction volume across all loan types for the second quarter of 2018 totaled approximately RMB7.0 billion (US$1.1 billion), an increase of approximately 1.4% compared to approximately RMB6.9 billion in the second quarter of 2017. Fincera issues interest-free revolving credit lines to small and medium-sized businesses ("SMBs") to fund their short-term working capital needs. The credit lines have a 30-day billing cycle. Outstanding balances after the bill due date are considered delinquent and subject to certain penalties. Fincera collaborates with cooperative borrowers in delinquency by working out payment terms to help them bring their accounts into good standing. Similar to credit cards, Fincera's credit lines contain no fees for borrowers as long as any outstanding balances are paid in full each month. Fincera generates revenue primarily by charging a merchant fee of 2.4%, which is then allocated as interest payable to the investor of the loan and facilitation fee income of the Company. Merchants may use funds received from transactions to make payments to other users or merchants, or to cash out the funds via transfer to a bank account. Credit line users are subject to an application and credit approval process and are required to provide guarantees and collateral. For certain payments, such as driver salary payments, a fee is charged to the borrower as the merchant in these scenarios typically will not accept paying a fee for such a transaction. In the second quarter of 2018, Fincera facilitated RMB3.3 billion (US$0.5 billion) in 30-day lines of credit transactions. Currently, Fincera's 180-day term loans accrue interest at 4.25% (or 8.62% on an annualized basis). Fincera charges a facilitation fee between 2%-5% depending on the type of the loan. The fee portion is collected by the Company while the investor holding the loan at maturity receives the interest payment. In addition, the borrower remits 5%-8% of the principal loan balance to the Company as a security deposit that is refunded to the borrower upon timely repayment of principal and interest. Payment of principal and interest is due in a lump sum at the maturity date at the end of the 180-day term. Outstanding balances after the maturity date are considered delinquent. In the event of delinquency, the Company will keep the security deposit as a one-time penalty fee and may assess additional penalties. As with the 30-day credit lines, Fincera collaborates with cooperative borrowers in delinquency to help them bring their accounts into good standing. In the second quarter of 2018, Fincera facilitated RMB3.2 billion (US$0.5 billion) in 180-day term loans. Fincera offers installment loans primarily to fund purchases of trucks and consumer discretionary goods and services, with the borrowed purchase funds being transferred directly to the merchant via Fincera's payment network. Based on the term of the loan and the type of purchase, Fincera charges a merchant fee of between 6.9%-8.6% on the transaction, which is then allocated interest payable to the investor of the loan and facilitation fee income of the Company, and requires some borrowers to provide collateral to partially secure their obligations. Terms of these installment loans may vary between three and 24 months; however, the majority of the installment loans carry a term of 12 months. In the second quarter of 2018, Fincera facilitated RMB466.5 million (US$70.5 million) in installment loans. The Company believes it has come into compliance with all announced regulations in China regarding peer-to-peer lenders. However, the registration process for peer-to-peer lenders in China has been delayed by at least a year and more detailed regulations are expected to be forthcoming. Mr. Jason Wang, CFO of Fincera, stated, "The first half of 2018 was a landmark period for Fincera. We were pleased to achieve record total income of RMB484.0 million in the second quarter of 2018 as a result of increased facilitation fees and increased other income, which primarily came from the strengthening of collection efforts of late payment fees and the sale of delinquent loans to third parties during the quarter. While we remain confident in the efficacy of our risk management process, we believe there is always room for improvement and will continue to strive for better. With the recent government scrutiny of peer-to-peer lending companies in China, we have made it a priority to ensure that Fincera is fully compliant with all regulations related to the peer-to-peer industry. We expect to see more government mandates in the future and will continue to monitor the situation closely. At the same time, our focus will remain on growing our business and serving our customers with innovative financial products and services that have become a vital part of their everyday lives." This release contains approximate translations of certain RMB amounts into US$ for convenience. Unless otherwise noted, all translations from RMB to US$ are made at a rate of USD1.00 = RMB6.6166 on June 30, 2018, representing the certificated exchange rate published by the People's Bank of China's Monetary Policy Division. No representation is intended to imply that the RMB amounts could have been, or could be, converted, realized or settled into US$ at such rate, or at any other rate. Total income for the three months ended June 30, 2018, increased 84.7% to RMB484.0 million (US$73.1 million), from RMB262.1 million in the prior-year period. Facilitation fees, which represent upfront fees charged for facilitating loan transactions via Fincera's marketplace lending platform, totaled RMB145.8 million (US$22.0 million) during the three months ended June 30, 2018. The Company began charging these fees in July 2017 when Fincera redeveloped its loan transaction process to comply with online lending regulations. Interest income, which represents interest earned on CeraVest loans held by the Company, decreased 37.1% to RMB57.6 million (US$8.7 million) in the three months ended June 30, 2018, from RMB91.6 million in the prior-year period, mainly due to an overall decrease in the amount of loans held by the Company as a result of the change in business model in July 2017 which resulted in the Company directly holding significantly fewer loans. Service charges, which represent CeraPay transaction fees, decreased 79.3% to RMB19.2 million (US$2.9 million) in the three months ended June 30, 2018, from RMB92.8 million in the prior-year period. Since July 2017, CeraPay loan transactions have been facilitated through a revised transaction process via Fincera's peer-to-peer lending platform. As a result, the service charges earned under the previous transaction process are now allocated as a facilitation fee to the Company and as interest payable to investors of each loan once the facilitation is successful. Thus, service charges have declined drastically since July 2017, and the Company anticipates it will eventually discontinue reporting this revenue item in future financial reports. Property lease and management revenues increased 14.6% to RMB51.9 million (US$7.8 million) in the three months ended June 30, 2018, compared to RMB45.3 million in the prior-year period. The average occupancy rate of the Kaiyuan Finance Center during the quarter ended June 30, 2018, increased to 89%, compared to 74% during the prior-year period. Income from the Company's hotel operation at the Kaiyuan Finance Center also increased during the period. Other income is mainly comprised of late payment fees (penalty income) from borrowers, as well as the receipts of the fees when delinquent loans are sold to third parties. Other income increased 545.8% to RMB209.5 million (US$31.7 million) in the three months ended June 30, 2018, from RMB32.4 million in the prior-year period, due to the strengthening of collection efforts and the sale of delinquent loans to third parties during the second quarter of 2018. The Company's operating costs and expenses increased 6.0% to RMB307.0 million (US$46.4 million) in the three months ended June 30, 2018, from RMB289.7 million in the prior-year period. Although interest expense and selling and marketing expenses decreased, the decrease was more than offset by an increase in provision for credit losses, which was primarily caused by an increase in the provision for credit losses from one major borrower. Interest expense decreased as a result of the change to our new business model in July 2017 in response to new regulations in China. Under the new business model, loans that are successfully subscribed by investors on the Company's peer-to-peer lending platform are derecognized from the Company's balance sheet. Therefore, interest due to these investors is also not recognized by the Company. In addition, large amounts of underperforming loans were sold to third parties during the quarter, which resulted in a reduction to the provision for credit losses, a portion of which is allocated to selling and marketing expenses as an accrued marketing expense per the Company's accounting policies, resulting in a reversal of selling and marketing expenses during the second quarter of 2018. The provision for credit losses still increased due to an increased provision being taken for certain loans. Income from continuing operations before income taxes totaled RMB177.0 million (US$26.7 million) in the three months ended June 30, 2018, compared to a loss of RMB27.6 million in the prior-year period, primarily as a result of increased total income as mentioned above. Income from discontinued operations, net of taxes, totaled RMB1.0 million (US$0.2 million) in the three months ended June 30, 2018, compared to RMB0.6 million in the prior-year period. The Company continues the winding down of its legacy truck-leasing business, which is classified as discontinued operations. This income is a result of the collection of overdue traditional leasing receivables, thus reversing the corresponding provision recorded against them on the Company's financial statements. Net income improved to RMB132.0 million (US$19.9 million) in the three months ended June 30, 2018, from a net loss of RMB17.8 million in the prior-year period. At June 30, 2018, Fincera's cash and cash equivalents (not including restricted cash) were RMB748.4 million, compared to RMB1.1 billion at December 31, 2017. Total liabilities were RMB6.1 billion and stockholders' equity was RMB317.1 million, compared to RMB6.9 billion and negative RMB119.6 million, respectively, at June 30, 2018 and December 31, 2017. The increase in stockholders' equity was primarily a result of a transaction into which the Company entered to exchange debt for equity during the first quarter of 2018. During the first quarter of 2018, the Company issued RMB188.6 million (US$28.5 million) in shares to Mr. Yong Hui Li, its Chairman and CEO, as repayment of certain debts. The repayment consisted of an RMB22.0 million (US$3.3 million) partial repayment of a loan Mr. Li had previously provided to the Company in March 2017 and payment of RMB166.6 million (US$25.2 million) still owed to Mr. Li from the US$2.00 per share dividend the Company declared in June 2017. The resulting issuance of 1.32 million shares was calculated using the trailing 90 trading day average price of US$22.71 per share. Founded in 2005, Fincera Inc. (OTCQB: YUANF) provides innovative internet-based financing and ecommerce services for small and medium-sized businesses and individuals in China. The Company also operates a network of branch offices in 31 provinces, municipalities, and autonomous regions across China. Fincera's primary service offerings include a credit advance/online payment-processing network and a web-based small business lending platform. The Company's website is http://www.fincera.net. Fincera trades on the OTCQB venture stage marketplace for early stage and developing U.S. and international companies. OTCQB companies are current in their reporting and undergo an annual verification and management certification process. The information set forth herein should be read in light of such risks. The Company does not assume any obligation to update the information, including forward looking statements, contained in this press release. (1) All per share amounts and shares outstanding for all periods have been retroactively restated to reflect Fincera's 2-for-1 stock split, which was effective on November 1, 2017.